One day, a B2B client asked us if we could help them find more keywords that bring more traffic and sales leads? Sounds easy with Google Keywords Planner, right? However, the client described in further that they tried Google keywords tool but this didn’t work at all because of very low search volume of keywords and variants they targeted. It’s really a big challenge to figure out more keywords without Google keywords tool, that conducts not only traffic but sales leads, especially in B2B manufacturing section. Fortunately, we’ve such solution in China online market, as we partner with one reliable state-owned company who’s huge in-house database to support strongly keywords digging journey, even traffic and leads analysis on any site you nominate. that conduct your website traffic and leads generation no matter what niche your business is. In a word, we give you clear picture where your sales leads should come from and what output you can expect. Keywords analysis is not enough. 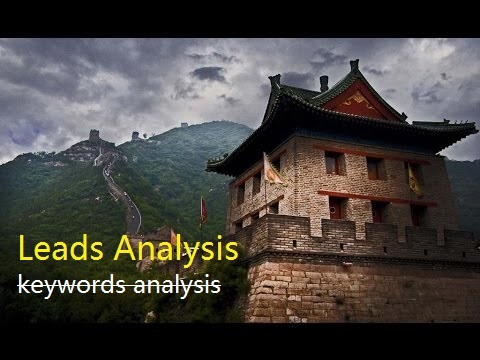 Traffic and leads analysis becomes crucial in the development of your digital strategy in China. Contact with us now for details if you’re interested. Just tell us your requirement today, and you will have details within the next 24 business hours.